These are responses to questions posted on the email list about how and why books were selected for use with AmblesideOnline. (Click here for comments about Van Loon's Story of Mankind). Charlotte Mason was so right about this one thing--if the books are good enough, the kids will rise to the challenge. My 11 year old is also doing some things from Years 5/6, as I hope to follow year 7 very closely next year. I can't remember exactly which books are from which year, but he read Oliver Twist last year, and is reading The Prince and The Pauper, The Hobbit, parts of The Story of Mankind, and Archimedes and the Door of Science. All of these have worked well so far. I don't plan to have him read the "extra" books that are very girlish--the Little House books, Little Women, etc, but they are available if he wants to read them. Last night I finished the schedule for the next four weeks, which will bring us to the end of our first term. As I think about next term, he will be reading Puck of Pook's Hill, The Swiss Family Robinson, and Tom Sawyer. I may assign other books as "free reading" books and not require narrations. All of the books he is reading are going well--he worked very hard last year at Oliver Twist, but I noticed, just this week, that he had the book out and was re-reading parts of it. Yeah! Not every child is going to love every book, but if your children are struggling with just one while they enjoy others, I would encourage them to persevere. If all of the books are too difficult, try going back to books from year 3 or year 4 and working up to them. Let's be realistic for a moment. <g> Many of the books on the AmblesideOnline Year 1-6 lists are on high school reading lists. Few of these books are "too easy" or "below" your average 10 and 11 year old. In fact, many of these books are the type to be read again and again over the years. You are the best judge for your own children. They should be challenged. If everything is "easy," there is nothing to stretch them. But you need to start where they are, and not give them work that will be discouraging rather than challenging. It's fine point, but most of us can make these judgment calls for our own children. My oldest is 11 and we are in our 3rd yr of AO. When we started AO, we started Year 4 and Year 2. I had never read such challenging books myself before. I love to read but have read twaddle all my life without knowing better! When I read The Little Duke aloud in Year 2 when we started AO, it was challenging for me! I had a difficult time keeping the characters straight and didn't understand a lot of the words myself! I had my daughter narrate though and she was getting as much out of it as I was (sometimes even more, gratefully!) and I forged ahead anyway. I started Year 2 again with my son this year, and am doing all the readings for him again and I must say, after 2+ years of AO readings under my belt, I am understanding The Little Duke so much better now! It isn't just The Little Duke I've noticed this with, but also Otto of the Silver Hand, Parables of Nature and Pilgrim's Progress. It's amazing how AO expands the mind. The point of this story being that I encourage you to persevere with your son, pick books that interest him and forge ahead. We listened to Water Babies on tape and, to be perfectly honest, it was not one of my favorites. Your son might enjoy Children of the New Forest from Year 3 more. He might really like The Hobbit from Year 6. The Sign of the Beaver, Johnny Tremain, Reb and the Redcoats from Year 4 he might enjoy. Year 5 has a bunch he could probably handle and enjoy. If he enjoys the story and topic of the book he will desire to persevere more and will benefit from the challenge in the long run and he may be more willing to read a few books he doesn't particularly care for if he has some favorites to look forward to reading. I'm continually amazed how much more my children grasp from their books because of the challenging literature they've been reading for awhile now! 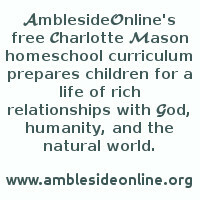 Two of our girls have been using AmblesideOnline since it began. They started in years 3 and 4, they are now in years 5 and 6. They love most of the books and like the rest - with one or two exceptions. The Year 6 child did not like Van Loon's Story of the World at all, however, she did finish it. The Year 5 child hasn't decided yet. The older girl hated Wild Animals I Have Known when she read it, so we dropped it and substituted a different nature study book (she found the death of all those animals too painful). My girls have always been homeschooled, they don't watch TV or many videos, and reading well is a survival skill in this household. The Year 5 child is considerably advanced in her reading skills, the Year 6 child is a slower reader (but thinks harder and deeper) -- this information is just to keep things in perspective. We did see a quantum leap with one of the girls when we started using AmblesideOnline. Reading was a struggle and a chore, and she didn't like it. I was very unsure of starting her on AmblesideOnline because it looked too advanced to me. But I did, although we took it just a little slower than recommended at first, and made more alterations to the schedule than we do now (now we pretty much do it all, as written). I was worried about it all during that first year, and often considered pulling back completely. I didn't, mainly because, in our personal family situation, I knew that she would see this as a defeat, a message that she wasn't as smart as her siblings. But I worried. By the end of the first year, Plutarch's Lives, translated by Thomas North, was her favorite book (at the beginning of the year she cried over it sometimes). It is hard sometimes to be sure when we are stretching our children enough, and when we are pressuring them too much -- and that's a decision only a parent can make in the end. But we have all been so blessed by the benefits of really challenging children's minds and stretching them and feeding them on the best in writing, that I like to share that, too. 2. Whatever book you use, try having the child draw a picture while listening. 3. Shorten the reading, immensely if necessary. If one sentence is all the child can process at a time, then do one sentence. 4. Give the child more time listening to folk tales, stories about 'when mother was a little girl,' 'when you were a baby,' and other oral tales that capture his imagination and give him things to picture that he can picture. 5. Read with LOTS of expression, drama, pathos, excitement, grief, sorrow, joy - whatever the episode you are reading about warrants. 6. If a page is illustrated, occasionally ask him first to imagine what you are reading in his own head. This could be very hard work, so don't over do it. After you've read the section, asked him to get a good picture in his mind of what you've read, and then allow him to look at the picture. Ask him to compare what he imagined with what's on the page. Something else we did along these lines: I have a boring, very un-CM book of geography terms. I would sit my children down on the floor with blocks and read the definition of a term to them, slowly and carefully. They would set up the blocks in a model of how they pictured that geographical feature from the description. After they had completed their model, we looked at the picture and compared it to their block model. We only did about four terms per week. They enjoyed it, and it really helped them learn to picture things in their minds. I think when I was doing this my two youngest students were either 8 and 9, or 9 and 10 (I also had a nursing babe and a toddler, but they didn't contribute anything constructive, if you get my drift). Question: Why aren't DK and Usborne books scheduled in AmblesideOnline's lineup? I don't think they are worthless. I think they can serve a place as supplemental material (for example, if you want to know what it's like in a desert), but that's where it ends. The "magazine style" of the pages--this little picture and caption, and that little sidebar or graph--caters to the short attention span fostered by television. Charlotte Mason wanted children to develop their ability to focus their attention for a sustained period of time (short, of course, in the beginning, but longer than a sentence here and there). Their lessons were to be literary in nature, and then narrated back. She eschewed the use of pictures--even for geography! !--because she wanted children to use their own minds to form an understanding based on verbal communication. They already had some type of cinema in CM's day, and she even doubted the efficacy of that. This is one of those areas where I suspect that Charlotte Mason may be right, but I don't really follow her wholeheartedly. I mean--yes, we could read about animals on the African veldt--but, watching a well-done nature/geography program about them really does seem to bring us closer to understanding what it's really like. For me, it doesn't have to be an either/or thing. We read Pagoo, for example, and then, watching a nature program on Discovery, saw an octopus grab a hermit crab. My Pagoo-educated children instantly related what they saw to what they had read about (even though it was months later). And then the hermit crab stuck a whole bunch of sea anemones on its back, for camoflage and protection. Would the program have had as much impact if they hadn't read the book? I don't know. But I do know that I prefer our school books to be, generally, the type that Charlotte Mason did recommend--living books with a literary character. This is what she felt children's minds naturally required for growth, and I do think she was right. I think Usborne books have their place, but in the final analysis, they are merely informational, and convey no real ideas, no inspiring thoughts to take root in a child's mind. And that's why they deserve the epithet, "not CM," which should not be taken to mean, "of no value at all." Question: Why not use abridged editions of classic books? I think that benefit of reading classic children's books is the telling of the story from the original author's point of view and passionate commitment to his subject matter which makes the difference rather than the benefit lying solely in the story itself. The author's language, difficult as it may seem, gives much of the life and vital lessons which Charlotte Mason wanted the children to find there in their lessons. While the children and adults can enjoy good retellings, and AmblesideOnline Curriculum does use some retellings in the curriculum, it is best to use these sparingly. The retelling we use are notable in their qualification as good literature in their own right. Examples of these are the Nesbit and Lamb's Shakespeare stories, Tanglewood Tales by Hawthorne, and The Heroes by Kingsley. There is a great deal of good literature appropriate for many different reading and understanding levels, and it is better to find those good and excellent books (old classics or more modern ones) on each different reading and understanding level than to repeat a small number of 'classic' stories over and over again. A 7 year old doesn't need to hear The Odyssey to get exposure to good literature, however if a parent wants to read and share their enjoyment of the story with a child, they can consider when they want to do this. Do they want to do it at age 7 and then again later in another form, or do they want to just wait? That is a parent's decision. Many times it is the enthusiasm we bring when sharing literature with our children which makes a good deal of difference in what they will sit still for. If a parent doesn't enjoy a book, maybe it would be best to wait to share the book until the parent can enjoy it. Reading good literature enhances one's ability to read other good and classic literature. The point in reading the classics is not simply to know the plot lines, which is all that really survives in many of the adaptations of classics prepared for children. Any set of Cliff's Notes could do this. The point is to learn to know the characters and something of their moral character and choices and thinking processes. It's to get inside the mind of another person, albeit a fictional one. These classical adaptations skimp on character development to focus on the action of the plot. It is a sad thing to think of all that is missed when you don't get to know the characters, have time to think about them and their actions, figure out what makes them tick, why they act as they do and make the choices they make. The descriptive language is important - it helps a child improve his vocabulary (one point of a Charlotte Mason education is to stretch the mind, not to remain where we are) and imagine things and learn to picture them in his mind, to visualize (an important skill often lacking in today's video generation). A child can learn much of good and evil, right and wrong, and about people and their various motivations and how they think and what sorts of people make up the world - and he won't get this from books that dumb down the language and leave out all the descriptive language and characterization. "There is no attempt to reduce the work of this form, or any other, to a supposed 'child level.' Form IA (ages 7 to 9) hears and tells chapter by chapter The Pilgrim's Progress and the children's narrations are delightful. No beautiful thought or bold figure escapes them. Andrew Lang's Tales of Troy and Greece, a big volume, is a piece de resistance going on from term to term. Children have an instinctive power by which they are able to sense the meaning of a whole passage and even some difficult words." "A boy of about seven in my school the other day asked his mother why she had not given him one of those pretty names they heard in the stories at school. He thought Ulysses a prettier name than his own, Kenneth, and that the mother of his playmate might have called him Achilles instead of Alan." There is profound need to cultivate delight in beautiful names in days when we are threatened with the fear that London itself should lose that rich halo of historic associations which glorifies its every street and alley, that it may be made like New York, and should name a street X500,-like a workhouse child without designation; an age when we express the glory and beauty of the next highest peak of the Himalayas by naming it D2! In such an age, this, of their inherent aptitude for beautiful names, is a lode of much promise in children's minds. The Kaffir who announced that his name was' Telephone' had an ear for sound. Kingsley's Water Babies, Alice in Wonderland, Kipling's Just So Stories, scores of exquisite classics written for children, but not written down to them, are suitable at this stage.... Their power to understand, visualise, and 'tell' a play of Shakespeare from nine years old and onwards is very surprising. They put in nothing which is not there, but they miss nothing and display a passage or a scene in a sort of curious relief. One or two books of the calibre of The Heroes of Asgard are also included in the programme for the term. . and here I would remark on the evenness with which the power of children in dealing with books is developed. We spread an abundant and delicate feast in the programmes and each small guest assimilates what he can. The child of genius and imagination gets greatly more than his duller comrade but all sit down to the same feast and each one gets according to his needs and powers. "What a piece of work is man . . . . In apprehension, how like a god!" ...There has been discussion in Elementary Schools as to whether an abridged edition would not give a better chance of getting through the novel set for a term, but strong arguments were brought forward at a conference of teachers in Gloucester in favour of a complete edition. Children take pleasure in the 'dry' parts, descriptions and the like, rendering these quite beautifully in their narrations.... The object of children's literary studies is not to give them precise information as to who wrote what in the reign of whom ?--but to give them a sense of the spaciousness of the days, not only of great Elizabeth, but of all those times of which poets, historians and the makers of tales, have left us living pictures. In such ways the children secure, not the sort of information which is of little cultural value, but wide spaces wherein imagination may take those holiday excursions deprived of which life is dreary; judgment, too, will turn over these folios of the mind and arrive at fairly just decisions about a given strike, the question of Poland, Indian Unrest. Every man is called upon to be a statesman seeing that every man and woman, too, has a share in the government of the country; but statesmanship requires imaginative conceptions, formed upon pretty wide reading and some familiarity with historical precedents." "...We are able to offer the Humanities (in the mother tongue) to large classes of children from illiterate homes in such a way that the teaching is received with delight and freely assimilated. One swallow does not make a summer, we all know, but the experience of 236 one school shows that it is possible to carry out a pretty full literary programme joyously and without effort while including all the usual school activities. Now, potency, not property, is the characteristic of mind. A child is able to deal with much knowledge, but he posses none worth speaking of; yet we set to work to give him that potency which he already possesses rather than the knowledge which he lacks; we train his reason, cultivate his judgment, exercise this and the other faculty, which we have no more to do with than with the digestive processes of a healthy child; we know that the more we meddle with these the worse for the child; but what if the devitalisation we notice in so many of our young people, keen about games but dead to things of the mind, is due to the processes carried on in our schools, to our plausible and pleasant ways of picturing, eliciting, demonstrating, illustrating, summarising, doing all those things for children which they are born with the potency to do for themselves? No doubt we do give intellectual food, but too little of it; let us have courage and we shall be surprised, as we are now and then, at the amount of intellectual strong meat almost any child will take at a meal and digest at his leisure. page 244 of volume 6: Much use is made according to this method of the years from 6 to 8, during which children must learn to read and write; they get at the same time, however, a good deal of consecutive knowledge of history and geography, tale and fable, some of which at the end of the term they dictate in answer to questions and their answers form well-expressed little essays on the subjects they deal with. The time appropriated in the time-table at this stage to the teaching of some half-dozen more or less literary subjects such as Scripture, and the subjects I have indicated, is largely spent by the teachers in reading, say, two or three paragraphs at a time from some one of the set books, which children, here and there in the class, narrate. The teacher reads with the intention that the children shall know, and therefore, with distinctness, force, and careful enunciation; it is a mere matter of sympathy, though of course it is the author and not himself, whom the teacher is careful to produce. This practice, of the teacher reading aloud and the class narrating, is necessarily continued through all the classes of an elementary school, because some of the books used are rather costly and only one copy is furnished. I wonder does this habit of listening with close attention to what is read aloud tend to equalise the children of the 'uneducated' with those of the educated classes? Certainly, the work of the two is surprisingly equal. By the way, there is no selection of subjects, passages or episodes on the ground of interest. The best available book is chosen and read through in the course, it may be, of two or three years." Let me close by sharing, once more, a personal story. I have a child who, though I dislike the term, I think would have been considered 'backwards' in Miss Mason's day. She had all the symptoms of a language processing disorder. I'd worked with her on her language and vocabulary skills for some time. When we began she struggled with these books. I was unsure of myself. I worried that we were doing too much, asking too much of her. By the end of the first year, books that she had previously cried over became her favorites. Miss Mason's methods have meant the world to her. ....whereas today's children know the storylines of sitcoms, and a few stupid movies. They don't know the grander themes. There is less of a cultural literacy, I think. I believe even in Shakespeare's day, the stories (the histories, the tragedies, the basic plotlines) were often already known by the people. What was new was the characterizations - and the language. In fact, it could be argued that the language is the most important part of any given story. OK, maybe not ;-) but still very important. But when we set out to read Shakespeare, or some classic piece of literature that has hard language, I think it's a good thing to know ahead of time what is going to happen, if the language is so "rich" that it is a challenge to the reader. We have all had the experience of getting so bogged down in the language of something that we finish and say "what on earth was that all about? I understood every word, and not a single sentence!" (Actually, I stole that line - I heard someone use it in introducing theologian Carl Henry before he spoke!) Beautiful Stories from Shakespeare and Tales from Shakespeare tell the stories so that when a person first tackles Shakespeare's actual play, the language is a joy, an illumination, not a barrier. Now, I've started to read something to my kids and gotten all excited that they were connecting, and then discovered that "well, it's because it was on WISHBONE, Mom!" <sigh> But - it sometimes sparked their interest to read further. A short-lived series on PAX called Little Men prompted my son to want to hear Louisa May Alcott's book read aloud (and he was quick to point out the differences, and appreciate what the author intended)....seeing the video of Little House on the Prairie caused an interest in the entire book series - and so on. Telling our children Bible stories when they are little may be why some children do better with the King James Version than others: the story is familiar to them, so that they can hear it in the more challenging language - and also hear nuances and truths impossible to communicate in an 'abridged' or 'retold' form. My children thrill to Pilgrim's Progress, which I am reading to them from my own childhood copy. I got it as a Christmas gift from my aunt when I was a little girl - and I recall reading it on my own. Much of it made sense to me, but a lot didn't....yet my kids don't have that problem. They have read - and seen the video from the church library - of Dangerous Journey (as well as another animated adaptation), and so the language enhances this experience for them. They know what's coming, they recognize the characters, and the story is still exciting and even more powerful to them for the rich language. I think that's a neglected part of most CM-styled education plans: we think that is getting between the child and the material. That is not so. When I introduce someone to someone else, I don't just walk away from two strangers...I give them enough info to prompt interest the one in the other, and then I 'walk away' or 'step aside' (actually or figuratively). If I stayed and continued to be an intermediary, explaining the one's words to the others, re-interpreting every nuance of expression and meaning, withholding information I didn't think the one could really get across adequately to the other, I'd be a meddler - and I would make that relationship much, much less than it could have been if I'd introduced them, and then stayed out of the way. (In Vol 3 chapter 21) Charlotte suggests that in choosing books, we must learn to make some rather fine shades of distinction - between twaddle and simplicity, and between vivacity and life. I've read this chapter on numerous occasions, but this is the first time that sentence really reached me (from page 229) - especially the distinction she draws between vivacity and life. It's not enough to a book that is merely lively - it must truly be living! And that is quite a task! Once the books are chosen, it is our job to let the students dig their knowledge out for themselves. In fact, she says, "Labour prepares the way for assimilation, that mental process which converts information into knowledge." 1) the child would learn of the people and lifestyles of the times when the classic was written. 2) Many classics are living books - and living books feed directly into long term memory... abridged classics often have the 'living' part of taken out to shorten or simplify the story - but then the story doesn't go into long term memory, only short-term memory. 4) If read when the reader is reading on an appropriate level, most classics are enjoyable. (that's how they became classics in the first place). I guess another way to say this is that many readers have developed a taste for easy reading and don't tend to stretch themselves. Yes, it is difficult and not as fun at first... but after a time of trying, suddenly the classics are full of life, and most of the abridged versions will seem like pablum... no substance. 5) Classics put us in touch with the living ideas of the authors. These living ideas are often not in abridged versions. CM exhorts us to feed our children a diet rich in living ideas. Charlotte suggests that in choosing books, we must learn to make some rather fine shades of distinction - between twaddle and simplicity, and between vivacity and life. I've read this chapter on numerous occasions, but this is the first time that sentence really reached me (from page 229 of vol 3) - especially the distinction she draws between vivacity and life. It's not enough to a book that is merely lively - it must truly be living! And that is quite a task! Another interesting point is her disregard for lovely detailed diagrams and models. I suggest you read this for yourselves, of course, but basically she feels that these things hinder real thought. Actually, she says this rather strongly - they "produce a torpor of though the moment they are presented." She suggests that the use of objects at hand, or a few lines quickly drawn, are usually enough to illustrate a point that requires explanation. It isn't as much any particular book as it is the quality of the writing and the thinking the student does - so I'm sure your daughter is just fine. It might help, since you just joined us a month ago, if I explain how we choose our books. We do look first of all for a very high standard in literary quality. We look at a quality I'm having difficulty translating into an e-mail. It's not exactly the moral of the book, because books with morals can be heavy handed and poorly written - but it must add something to the imagination, to the moral imagination - it must have something that we feel can bring the reader to another place and time, to make him 'wonder.' But many wonderful books that fit all these criteria don't end up on AO's list. This is because we intend for this program to be useful to missionaries overseas, to farmer's wives in small towns with almost no library, to single moms, to military members stationed on remote bases on obscure little islands in the Pacific - in short, to anybody and everybody who needs it, no matter what their circumstances, we had certain limitations on the books we could choose. They had to be either available online, still in print, or, if out of print (and we only very reluctantly choose 'out of print' books) they must be inexpensive, and still readily available. Even books in print had to be reasonably priced. So your daughter may very well have read some books we would have chosen, but couldn't because they didn't fit these criteria. The average homeschooler is not bound by the same restrictions. She also may have read some books that are going to end up in the upper years, so she's actually 'ahead' rather than 'behind' (though something about that 'ahead' and behind with AO as the standard makes me very uncomfortable, downright nervous, in fact). There are good books, excellent books, that we can't use. There's nothing wrong with substituting books books you have for books on the list (we just ask that these substitutions not be discussed on list because there's no limit to the substitutions that could be made and an e-mail list of this size simply must have some limitations or nobody could keep up with it). I think it's important that we realized just what she is saying here. We really aren't talking about a question of NO pictures or diagrams. We all know that Charlotte Mason recommended map work, for example, and even in this chapter, she suggests that simple diagrams might be more useful than complex ones. She is not suggesting that we do without any kind of visual aid, but that the visuals be simple and perhaps minimal. I think that visual "mind maps" that you make yourself, from your own reading and understanding--are not at all what she is objecting to. It's the very detailed models and diagrams that seem to overwhelm the mind. It's not an issue of no visuals at all, but a matter of keeping them simple. How do you recognize a Living Book? The definition of living books doesn't apply only to fiction, and it doesn't mean (according to Charlotte Mason) only a long book, or even always a "primary source". We have a book called The Pond on My Windowsill which is all about insects and other creatures that the writer collected from a pond and which lived (when he wrote the book) in a big aquarium in his house. He tells all about how and when he collected the different species, how they change and grow, and about some things you DON'T want to put in an aquarium because they eat the rest of the creatures! It was so much more interesting than going through a rather dry textbook or filling in a bunch of worksheets about the names and characteristics of different insects. Ever since we read this book, we (oldest daughter and myself) have been interested in looking for dragonflies and other pond creatures, and more aware of creatures we'd never known about before, like water striders. When we see a picture of something we read about in that book (and that was a couple of years ago now), it reminds us of what we read about then. This was a book written in chapters with some illustrations, rather than a photographic book with just a little bit of text. Another "living book" we read last summer was translated from French. The title is Stories of Alexander the Great, by Pierre Grimal. The book had hardly any illustrations and you would not have thought it would interest a 9 year old girl very much, but we read it all, following some maps as we went, and my daughter couldn't wait to hear what would happen next. Neither of these books are part of the AmblesideOnline curriculum, and both of them are out of print and hard to find. I mention them only as examples of books I've come across myself that I consider living books - they are well written by people who enjoy their subjects and can make them come alive for others. If you look at the books chosen for AmblesideOnline, you'll see more examples of what we consider excellent writing - and not always written specifically for children. Some of them are very challenging. They cover a variety of subjects - fables, folk tales, myths and legends, poetry, history, geography, nature, biography, etc. They are full of excellent ideas, but they don't "talk down" to children or tell them exactly what ideas they are supposed to take away! For every child it will be different. Question: Why is Van Loon's Story of Mankind recommended only for students Year 5 and up? The language and style look like younger students would have no problem understanding it. I guess this is primarily a subjective issue, because the writing style and vocabulary of Van Loon certainly seem to me to be addressing young people of about 11 and up, while An Island Story seems to me to be geared for much younger children. I think Van Loon is also much more involved, giving details about background and situations that are not of much interest to younger children. Island Story in particular is largely about kings and others in positions of leadership, and each chapter is centered primarily on the individuals, giving a broad overview of more interest to young children. Van Loon includes more background detail that seems to us more suited to the needs of older children. Van Loon also has a somewhat sarcastic turn of mind that is best, I think, used with older children with a little more discernment under their belts than the average Year 1 child. Question: Charlotte Mason gave Van Loon's Story of Mankind a favorable review, but some reviewers have criticized the book as being historically inaccurate. Is that because Van Loon isn't politically correct, or are there real errors in the book? I am not really sure exactly what people who complain about Van Loon are talking about when they talk about historical errors. This complaint is also found in reviews of An Island Story, with the same lack of detail. Unless a reviewer cites specific instances where they disagree with the coverage of an event, then it is my personal policy to place that review in the realm of personal opinion very possibly informed by a personal agenda which the reviewer wishes to keep hidden. It might be that I share that agenda or starting assumption, but as long as the reviewer isn't sharing it, I can't tell. In such situations, that review is of negligable use. When reviewers complain about historical inaccuracy without specifying what exactly is inaccurate, I have to wonder why. They might be of one political persuasion, and Van Loon another, or they might believe that the South should have won the American Civil War/War Between the States and Van Loon doesn't, or they might love Picasso and Van Loon doesn't (these are primarily just randomly chosen 'what ifs' purely for the sake of example)--the point is that their own personal starting assumptions or personal belief systems may be incompatible with Van Loon's, and if I knew what it was they disagreed with, I could more accurately measure the value of their criticism. I will say that, in my opinion, Van Loon is not warm and friendly toward Christianity, but this is a defect overcome by proper teaching in the home, in my opinion. I will also say that I have not ever seen any history book that was 100 percent accurate. I have seen errors of omission, errors of commission, errors of slant, bias, and fact, and/or poor literary style in every single history book I have ever looked at, and this means upwards of a thousand at the moment. So we have to choose between imperfections, really. Question: Why does AmblesideOnline use so many old books? Many, including Van Loon's Story of Mankind, were written over 75 years ago. Aren't there any books being written today that are living and literary? In general, well written older books use richer vocabularly, more complex sentence structure, and contain more ideas per page than modern books. Recently written books, by contrast, use watered down language and sentence structures and sandwich meaningful ideas in between pages and pages of fluff. Older books that we use have also stood the test of time. They have been read for generations and will be read for generations more. It's too early to tell which of our current crops of books will still be communicating to readers outside of the culture and time that produced them. Finally, and by no means least important, older books are in the public domain. This means they are available on line as etexts, and will remain available. I can't tell you how frustrating, how much gnashing of teeth it causes the Advisory when a book goes out of print. We spend, truly, thousands of Mama-hours (these are worth more than man-hours, right? Just Kidding!) researching books. We amaze our librarians with the number of books we check out from the library and put on interlibrary loan. When all else fails, we actually, gulp, spend money on a book if we can't find it to review it any other way. We scan excerpts of different books into our computers and pass them on to each other to compare and contrast. We look at the wording, the breadth and scope of coverage, the illustrations (if any), topics covered (and just as important, topics not covered), and then, after devoting months of our lives to this project, we finally pick the best book of all those available and proudly and gleefully announce it to the list. Then it goes out of print and we all have to go on anti-depressants and receive hours of pastoral counseling. Okay, that last part was an exaggeration. We don't go on medication. Seriously, though, the newer, in-print books have a Very High turnover rate. They very quickly become newer but now hard to find and out of print books, and thus, of no use to us. Individual homeschooler can use and benefit from those books, of course. Some of them may actually be better than any given book we have listed. But a book that may be perfect for your family (or mine) is not perfect for AmblesideOnline if it's out of print and not online. Here's why out of print but not yet in public domain books are not very useful to us. We want to share our vision of what a Charlotte Mason education might look like put into practice, and at the same time, we want to make that vision available to as many people as possible who might want to benefit from it. We specifically want to consider the unique situations and needs of missionaries, military, and other expat families overseas; single parents; families without access to a decent library, a good bookstore, or inexpensive shipping; families who travel often and so cannot cart thousands of pounds of books around; and fellow homeschoolers all over the world. We want to create one version of what a CM curriculum might look and we want that version to also work for all those different families I mentioned. The best way for us to do that is to rely strongly on public domain works that can be used as etexts. This is not the only way to implement Charlotte Mason's ideas and principles. These are not the only books worth using. But these are the books that best fit the criteria we set for ourselves at the start of this project. We want to offer a model of what a real living book, packed with informing ideas rather than twaddle and barren facts, looks like- and so we have chosen what we believe to be the cream of the crop from those books that are online or still in print. However, we understand we are offering a model - not the model. P.S. Just a general list reminder that we do also encourage members to make the curriculum their own and adjust, adapt, and substitute where they need to--with the caveat that for a number of reasons we have explained onlist before, the AO email list list simply cannot be the forum for discussing alternate titles and substitutions. I guess you could say we have a don't ask/don't tell policy about book subsitutions here. The proper place for discussion of substitutions is over at our sister list (or should it be our daughter list?) - AmbleRamble. For discussion about AmblesideOnline's use of books that contain evolutionary content, click here. "If you are reading in order to become a better reader, you cannot just read any book or article. You will not improve as a reader if all you read are books that are well within your capacity. You must tackle books that are beyond you, or, as we have said, books that are over your head. Only books of that sort will make you stretch your mind. And unless you stretch, you will not learn. "Thus, it becomes of crucial importance for you not only to be able to read well but also to be able to identify those books that make the kinds of demands on you that improvement in reading ability requires. A book that can do no more than amuse or entertain you may be a pleasant diversion for an idle hour, but you must not expect to get anything but amusement from it. We are not against amusement in its own right, but we do want to stress that improvement in reading skill does not accompany it. The same goes for a book that merely informs you of facts that you did not know adding to your understanding of those facts. Reading for information does not stretch your mind any more than reading for amusement. It may seem as though it does, but that is merely because your mind is fuller of facts than it was before you read the book. However, your mind is essentially in the same condition that it was before. There has been a quantitative change, but no improvement in your skill. "A good book does reward you for trying to read it. The best books reward you most of all. The reward, of course, is of two kinds. First, there is the improvement in your reading skill that occurs when you successfully tackle a good, difficult work. Second--and this in the long run is much more important--a good book can teach you about the world and about yourself. You learn more than how to read better; you also learn more about life. You become wiser. Not just more knowledgeable--books that provide nothing but information can produce that result. But wiser, in the sense that you are more deeply aware of the great and enduring truths of human life." AO uses so many ancient books! There have been so many books written since Charlotte Mason's lifetime, why does AO remain stuck in the 1800's by insisting on using the same old books that Charlotte Mason used? I think she would have been hard-pressed, as we are, to find books that are current yet still well-written in our modern visually-oriented culture. In some cases, the best book is an old one simply because nothing modern is of the same literary quality. Didn't Charlotte Mason say that she envisioned a living, changing method, and not a rigid system? She would never have used a curriculum, she wanted us to decide what to use ourselves. Actually, she did have a curriculum. Her schools and tutor/governesses had Programmes listing exactly which books to use and which pages to cover in a term. She also wrote detailed explanations of the philosophical method [known as the six-volume Home Education series, available from most booksellers or online here for free] so that anyone could understand why certain books were chosen and not others, and so that anyone could have the option of coming up with their own plan of study. So, yes, anyone can devise their own curriculum. But her own teachers used her Programmes. But she was constantly making changes in her booklist so that her schools never got stale and stuck in a rut. She never intended schools to blindly follow a static booklist. Charlotte Mason was interested in using the best books. If a better book came along, she'd use it. She also wanted teaching to remain interesting for her teachers. A teacher using the same book year in and year out would probably get bored. For most of us parents, staleness is less of a concern (unless we have so many children that we're repeating each year a lot!) And many homeschool parents are on a budget and like being able to re-use books with all of their students. So, here at AmblesideOnline, if we find a book that's better than one we're using, we'll make a switch. But since this plan is intended for parents and not schools, we don't continually change our booklists just for the sake of change. You bring up a good point about relying on a booklist to educate students. Without understanding the reasons and vision behind all of the CM method, even a curriculum like AmblesideOnline, or even using one of Charlotte's programmes themselves, won't give your child a Charlotte Mason education. You need to read Charlotte Mason's books and gain an understanding of her philosophy. Someone had the audacity to suggest a twaddly book when I asked about substituting a history book on another AO-related email list. Why do you allow people to give that kind of advice? Or, better yet, why can't I get suggestions for great book substitutions right here on the AO email list? We (Advisory members) don't keep track of all the various AmblesideOnline lists that our members start -- we'd never have the time! So you may find discussions of books not used in AmblesideOnline, depending on who moderates and what rules they enforce. We wouldn't even know if twaddle was being recommended because we aren't subscribed to all of the lists. We can't take up much time on THIS list discussing books we haven't included in the curriculum, but I know there are some Advisory members who sometimes find time to participate on the AmbleRamble* list, and do sometimes answer questions about why one book was chosen over another one. You could probably even find some info about specific titles in their list archives. Leslie gave an excellent response and I have a couple of points to make too. The AmblesideOnline curriculum was designed simply so that people wouldn't feel that they needed to start right from scratch. Many of us who were going it on our own (even before the Internet connected so many people with an interest in Charlotte Mason) felt the need for greater connectedness, if you'll excuse the word (I can't think of a better one) with others whose children were working at approximately the same level; we felt it would simply be an advantage if we could say, "my third grader narrated Minn of the Mississippi like this this week--what did yours say?" With so many people now using AmblesideOnline and starting at all different times, it's obviously not possible to keep that closely in step with each other, but we have been able to support each other in many ways that were not previously possible, by using a common curriculum. Finally, we have had good interactions and good feedback from other parts of the Charlotte Mason community, including people who were involved at the conference in North Carolina. Let's make it clear again (as we point out on the website) that nobody thinks AmblesideOnline is the only way to provide a Charlotte Mason education. For some people, it feels much more natural to go more with the flow of what their own family is doing and what books are available to them. But on the other hand, I don't believe that we're doing it all wrong. This curriculum grew out of a network of people who first "met" via the CMSeries study list and other Charlotte Mason discussion groups, and our intent, plain and simple, has been to provide what we feel is a program that is true to Charlotte Mason's ideals and reflects (but does not blindly copy) the curriculum that she was responsible for right up to the end of her life. "The study of our English classics conduces to an increased vocabulary, a growing command of the mother tongue, an appreciation of the best that has been thought and said in the best possible way, prepares for participation in the active affairs of life, as well as for the pleasurable and profitable spending of leisure time. Our children have too few opportunities of browsing on good books: they leave our schools too frequently without the desire to know our classics more intimately, the classics of a literature, one of the richest in the world, the history of which records the names of a thousand worthies of first-rate importance, some of whom, by virtue of their intrinsic merits and artistic and emotional qualities, the world will not willingly let die. The ground properly prepared, systematic study of great poetry, of great drama, of great prose, can be undertaken best only when ready access to suitable authors is possible, and to good stories suitable for children. Lessons about literature, lessons dealing with the history of literature, stories derived from literature, useful as they are, can never have the effective value that is obtained from first-hand acquaintance with authors." You may also enjoy Wendi's thoughts on the role that pictures and graphic media play in the process of education. Read this Advisory blog post about how limiting texts to only words that a child already knows can be detrimental to their intellectual development.